Yes, the KALLAX shelf underneath does retail for about $67 (I’ve found them on sale for $50 new), but the CAPITA legs on it are a $13 set, ($80 total), the wooden countertop is KARLBY Oak retailing new at $170 ($250 total), and the leg supports for the countertop are GERTON Legs, fully adjustable at $30/ea ($310). 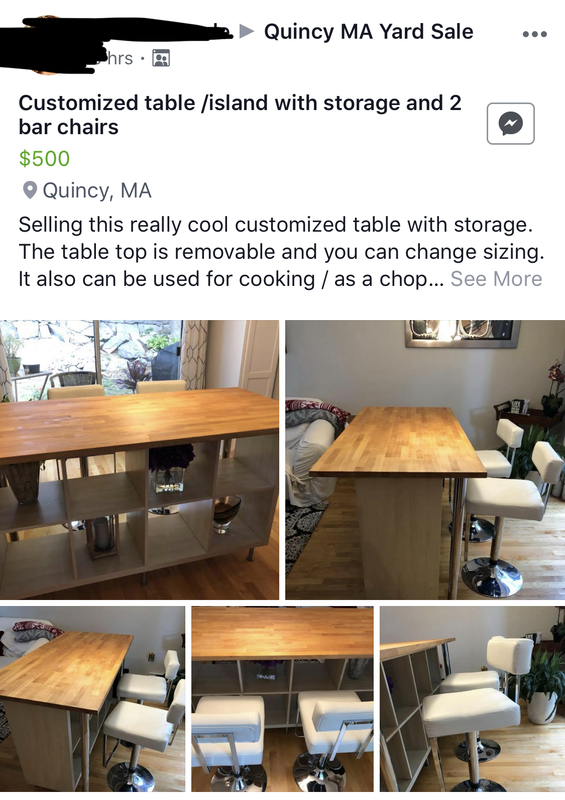 I can’t find the barstools online, but comparable white leather barstools pairs range from $100-$150+ (Total $410-460+). Now, we have to factor in the labor putting this together in the first place, and you’re looking at a fair market price pretty spot on at $450-$500. It’s fully adjustable, and technically you can put any IKEA countertop on top of this and make it work pretty well. Honestly, I think just buying the STENSTORP counter already built with a purpose at $399 is a better grab, but it’s cool seeing this customized island. Yes, I go to IKEA too much and consider myself an expert.